One helpful factor to consider when choosing which MBA program to apply to are the employment statistics. While almost all MBA programs have solid consulting and banking employment numbers, health care results are less consistent across schools. 1) Health care is a relatively new industry that consistently recruits MBAs. Because of this, brand recognition for MBA schools in this sector is just forming. There is really not much out there in terms of school recruiting performance so this is a start. 2) When engaging with prospective students, I often get asked how strong the HSM program is. The only data I really have is that we're the largest program in terms of body count. Other than that, I didn't have any objective data to give folks a comparison. We know from Fuqua professor Dan Ariely's work that relativity is important to human decision making, so I thought I'd find some data to help prospective students out. I took a look at top 20 programs that were known for health care or had significant recruiting numbers for the industry. I then went on to each program's website and analyzed publicly available employment data to draw some comparisons between schools. Initially I wanted to look at biotech and pharma stats only, but very few schools offered that level of detail, so the following data is for all health care companies. Here's a rough look at the health care employment results between leading US MBA programs. 1. 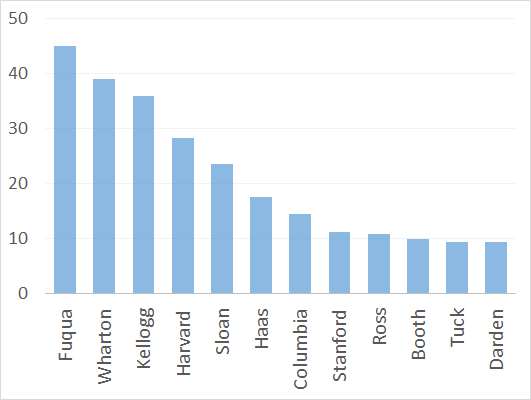 Fuqua, Harvard, Wharton, Sloan, Haas take the lead in absolute numbers that were hired to health care companies. Looking at only data from the 3 classes graduating in 2011, 2012, 2013, I calculated an estimate of the absolute numbers of MBA grads who were hired into health care companies. There are some issues with the data as each school reports their data slightly differently (see the methods section below for details on the original data). 2. 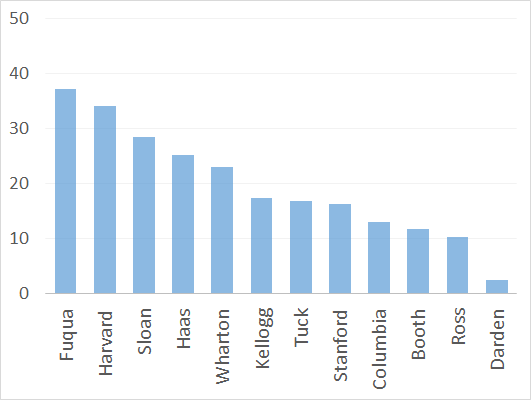 On average, the 12 US business schools in this sample have 20 students per year hired into health care companies, or 5% of their class - each year. 3. 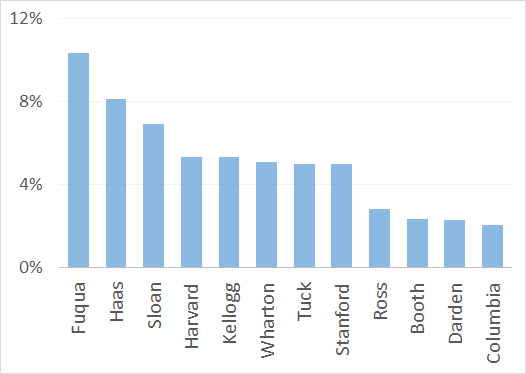 From 2011-2013, Fuqua leads in total percentage of its MBA class hired into health care companies with 10%, followed by Haas and Sloan with 8% and 7%, respectively. 1. Employment data appears to be self-reported, so the absolute numbers will be only a ballpark figure. This post should only be used to get a rough comparison of programs and not as an absolute analysis. 2. It is unclear for some schools how they calculated their percentages, so I assumed all of the denominators are # of students actively seeking jobs, and not total students. Some schools do this differently (for example for some years Columbia included sponsored students in their %'s) but I tried my best to be consistent. 3. For Tuck, Haas, and Sloan I used 2013 internship data, as at the time of writing (Winter 2013) that was the only data available. I may update this later to include full time data. 4. Does not include consulting or banking positions that focus on health care. Instead, these data points are typically contained in consulting and banking categories for schools. Would love to hear people's thoughts in the comment section below! This is good research. But what do you mean when you say that MBAs for the health care industry is quite new? Thanks for the comment. Traditionally, MBA programs were pipelines to fill the consulting and banking industries. Nowadays, MBAs are pursuing many alternative career paths. The health care sector is one that has recently been increasingly recruiting MBAs. For example, hospitals are now seeking MBAs in their leadership programs as the market is rapidly evolving. These positions were traditionally filled with MHAs or MDs. Many pharma and med device companies now have leadership development programs. Great analysis Steven. 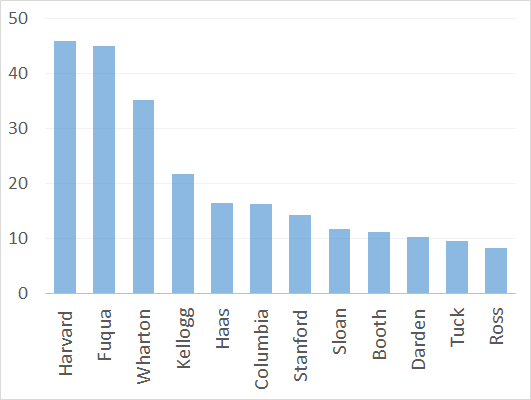 Given the fact that class size of Fuqua is around 50% the size of Harvard, I was surprised that Fuqua pretty much matched Harvard (outperformed it in certain cases) in the healthcare sector. Its interesting to note that in 2013, the number of MBAs hired by healthcare sector decreased across schools. Any thoughts on what caused this pattern? It'd be great if you can share a few details on the leadership development programs like total number of pharma/biotech companies having such programs, number of fuqua candidates hired by these programs etc. (Tried looking for that information. I couldn't find a comprehensive source. I was wondering if Fuqua career office had that information). Also, curious to know how the healthcare hiring at Fuqua is being benefited by the Research triangle. Do the mid-size, small size biotech/pharma companies at Research triangle hire candidates from Fuqua? 1) Great observation for 2013. A couple of reasons may account for this. Since I pulled the data in Dec 2013, some of the schools may not have included folks who got their jobs a few months after graduation. In addition, I am not sure the differences are significant, since only 3 years worth of data are displayed here. There may just be some natural fluctuations from year to year. Again, the data isn't clean since it is self reported, and reporting criteria from the same school may differ from year to year. Each year's class composition is also different, so you'd expect ups and downs given people's diverse goals. 2) I had trouble finding this when I applied as well. My recommendation would be to go on LinkedIn and do a search of "school" and "company" and select the "currently employed there" option. Usually recent grads in rotational programs will put down the program's name on their job title, such as ECLDP for J&J or CRDP for Genentech. This'll take some time, but other than contacting the school this information will be difficult to find. 3) Some local RTP mid-sized firms recruit at Fuqua, including tech, biotech, consulting. Larger local companies like Biogen, GSK, Quintiles, BD also have had Fuqua interns/full time hires. In my view, RTP has a lot of early stage activity and does not have the mature healthcare startup environment as say Cambridge or South San Francisco. Early stage companies are more keen on hiring interns, as full time MBA talent is quite expensive to obtain and startups need to be efficient. With that said, keep in mind that you can do off campus recruiting at Fuqua, and many have been successful in doing so. In sum, RTP is on par in terms of startup internship recruiting, whereas other hubs would be better for startup fulltime recruiting. Let me know if this makes sense. Just to add on to #3. This comment was based on my extremely limited effort in recruiting for startups in general for the summer. I was more focused on recruiting for pharma and getting the "big company" experience. I've drove around RTP and saw quite a few mid-sized biotechs. If you were to really immerse yourself in the biotech startup scene, I'm sure there are many opportunities that I am missing. Hi Steven, Why have you not included Kenan-Flagler in the above comparison? I saw its employment statistics and found that it has a great presence in healthcare MBA. Great point. I just checked Kenan-Flagler's career stats for the Class of 2014, and 13% of the class went into health care. That's about 36 folks each year. Will include UNC in my updated post for later this year. Thanks so much for the heads up! Thanks Steven! Im on the road to doing my mba research and like you I am currently a research associate in a biotech firm trying to transition into business development. Your articles definitely help in narrowing down my target schools. You're welcome! Glad to know that it has helped. I plan to update it once schools have their class of 2015 data available. It is an exceptionally expansive field and the strategies are assorted in their philosophies which can join or construct themselves in light of conventional solution, people information, otherworldly convictions or recently planned ways to deal with recuperating. References - Paul, B., n.d. Test RX Research: Benefits, Side Effects & Guide! [WWW Document]. Testosteroneofficial.com ie. Testosterone Official. URL https://testosteroneofficial.com/reviews/test-rx/ (accessed 10.21.18). A blog that mushroomed from visual illumination. Hiring a mental health therapist can be a daunting task especially if you've never engaged efforts to hire one. There are quite a number of things you need to determine so as to make the right choice. First and foremost you need to identify why you need a therapist; listing down all your needs in a piece of paper can aid in deciding which therapist to hire. There are quite a number of places you can visit to get good information about hiring mental therapist; one of the most preferred avenues by most people is the internet. Mental health therapist displays information about their expertise on their website homepage. Finding such homepage is quite easy; all CBD for anxiety and depression need to do is visit your favorite internet search engine and affect a keyword search on mental health therapist. The holistic approach includes cbd wax body and spirit techniques that can be integrated with conventional treatment. "Hey guys, I just published this article 40 Awesome Nootropic Blogs, so wanted to share a short-and sweet version here. Today, we’re going to take a look at the fascinating world of nootropic blogs, highlighting the best of the best, so you don’t have to look anywhere else. In short, we’ve done the hard work for you; shifting our way through hundreds and hundreds of nootropics blogs, filtering them down through our strict guidelines and benchmarks of quality, content, and consistency, until only 40 exclusive blogs remained. The nootropics industry is one that has progressively, yet rapidly, taken off around the world and has no signs of slowing down. The science of biohacking and cognitive enhancement has never been more popular and the more people that are introduced this world, the more information there is to learn and the more we have to process. With this in mind, there’s no.............. Continue Reading http://www.blackburndistributions.com/blog/top-40-nootropic-blogs/"
Should you get an MBA or an industry position?